As coffee connoisseurs we don’t have to leave our home to get good coffee. But when we do, more often than not you’ll find us enjoying a doppio cappuccino or an espresso macchiato at Al Ponte — a genuine Italian coffee kiosk right across from Central Station. Across from Central Station, Caffé Italiona Al Ponte, has built itself a reputation for serving some of Amsterdam’s best coffee. ‘Right across’ in this case means across the river IJ, right on the water’s edge in Amsterdam-north. One moment you’re caught up in the hustle and bustle of one of the busiest spots in Amsterdam, and the next moment — after a short, 5-minute free ferry ride — you’re relaxing on the waterside terrace of Caffé Italiano Al Ponte. Mind you, this is the type of coffee bar you see all over Italy — in essence something of a glorified bus shelter providing outdoor seating only. It’s glorious during the spring, summer, and early fall — and even on those mild winter days that our changing climate has brought us during the past few years. 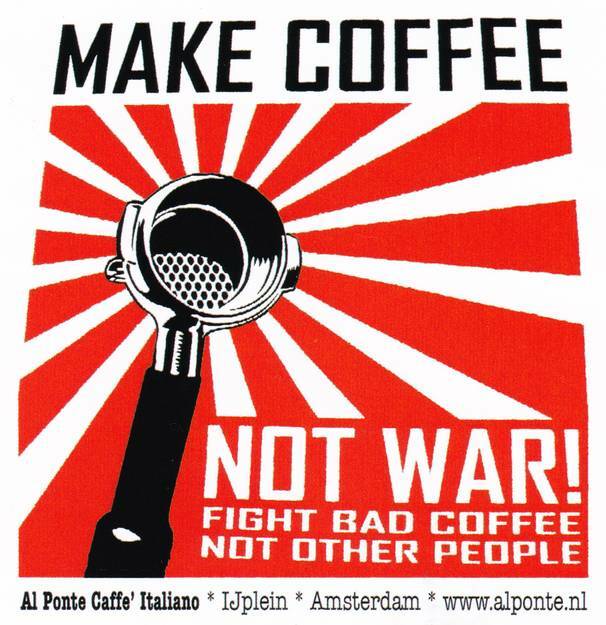 That’s when folks like us go out of our way to drink a few cups of what many (us included) insist is the best coffee in Amsterdam. And then there are the sumptuous panini imbottito — Italian-style sandwiches, freshly prepared hot or cold on the spot. On offer are vegetarian, vegan, and non-vegetarian varieties. Local newspaper Het Parool even declared one of the sandwiches to be among the best in Amsterdam: #15 with Pancetta, homemade olive tapenade and cheese (warm). But we already knew that. 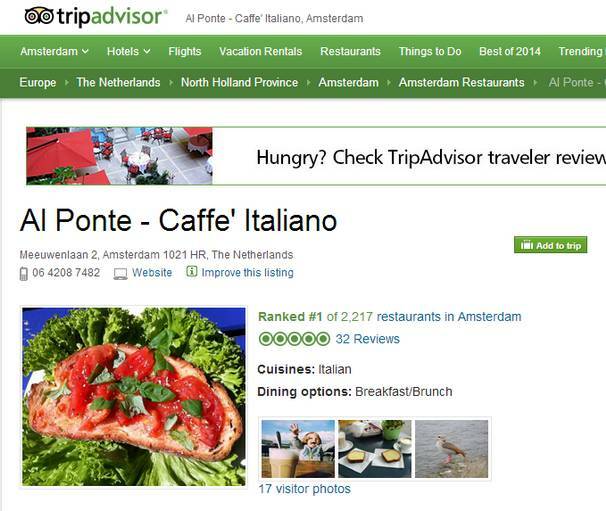 Al Ponte has been among our favorite go-to spots in Amsterdam for a long time now. By the way, you’ll find that nowadays lots of regulars opt for the newest creation: #22 Speciaal, a warm sandwich with soppressa, grilled peppers, melted cheese and rucola. Absolutely wonderful! 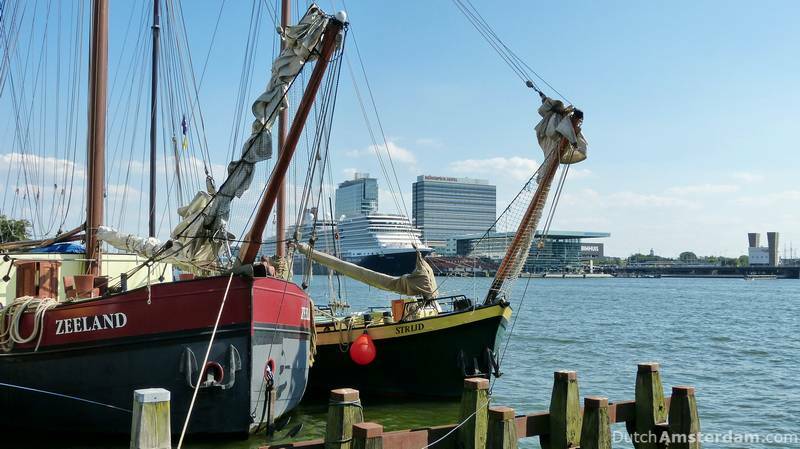 You take a free, 5-minute ferry ride from behind Central Station to IJplein. Kids and adults alike enjoy the ride (and nothing prevents you from going back and forth a few times). Again, there is no indoor seating at Al Ponte. It is, after all, housed in a tiny kiosk. That’s a drawback during inclement weather, but the rest of the time you wouldn’t even want to sit inside if you could. For one thing, the Caffé’s terrace overlooks the river IJ, providing a panoramic, ever-changing view. There’s a never-ending parade of boats and ships: anything from sloops and barely-floating dinghies to huge cruise ships, and from expensive yachts and stately tall ships to container ships and barges. You have a good view of Central Station, the Saint Nicholas basilica — the bells of which often can heard clear across the IJ — and the south-east skyline of Amsterdam. For another, Al Ponte is situated right where the ‘pont’ — the free ferry to and from Central Station — docks. (Yes, Al Ponte — Italian for ‘the bridge’ — is play on words). The small square, known as Pontplein, gradually fills up with people waiting for the next ferry, which sails every 12 minutes or so. This makes for excellent people-watching. Like the rest of the city, Amsterdam-north is so multi-cultural that you often feel like you’ve wandered into a real-life National Geographic television show. Lots of tourists use the IJplein ferry (named after the neighborhood) as well. They’re either on their way to or from the nearby Vliegnbos camping, or they use the square as the start or finish of a bike tour through rural North. And of course, many locals and tourists alike use this spot as the start-off point for a walk or picnic along Noordwal — a still off-the-beaten tracks promenade along the banks of the river IJ. Owner Silvia — motto, “Make Coffee, Not War” — hails from Italy. Her staff is Italian as well. Perhaps that explains the friendly service — always with a smile and, if possible, a chat. It certainly explains the quality of the coffee and the food (by the way, you’ve got to try the home-baked grandmother’s lemon cake). 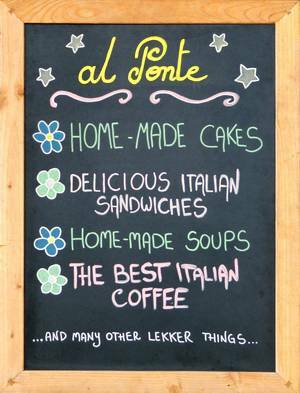 If you’re learning Italian, this is the best place in Amsterdam to go. Lots of Italians make Amsterdam their home, having moved here either for love or due to the economic realities at home. And you’ll always find lots of them hanging around the place — which we think is a good sign. Al Ponte opened in July, 2007 — 11 years after owner Silvia moved from Italy to Amsterdam. 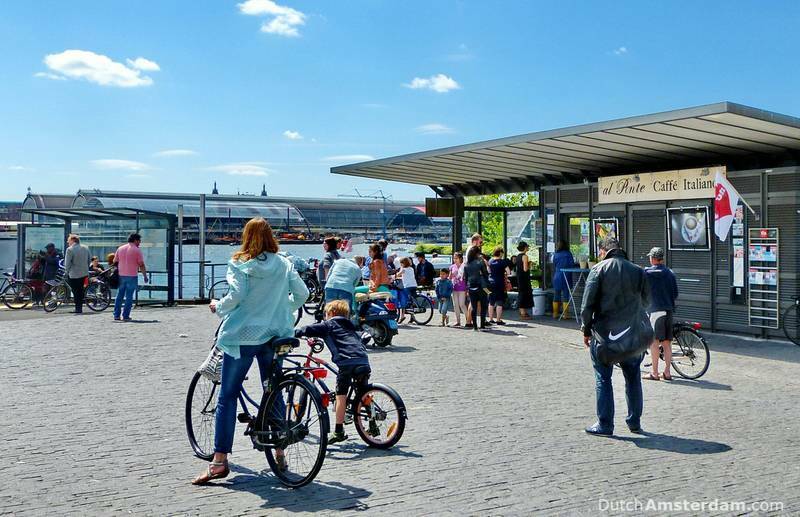 In early 2007 the city had fixed up the Pontplein — literally, ferry square, in reference to the fact that one of the free ferries that sail pedestrians and bicyclists back and forth across the river IJ between the Amsterdam-north borough and the city’s center at Central Station. At the time, the borough started looking for an entrepreneur willing to set up a business in the kiosk at the small square. Silvia’s proposal won out, and the rest is history. Incidentally: while Amsterdam-north was once a place where no true Amsterdammer would want to be found dead, over the past couple of decades the borough has transformed (a process that is in overdrive right now) into a must-see district with top restaurants, quaint villages, nature areas and cultural hot-spots even the New York Times raves about. Walk through Central Station and exit at the back (the IJ-side). If you take the east-most tunnel through the station you will exit close to the ferry landing. 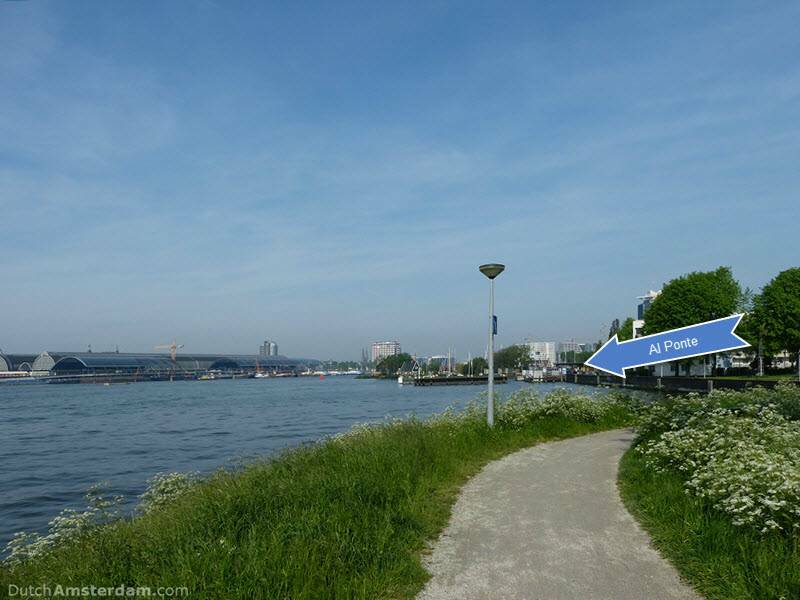 The Ferry should carry as sign with the designation “IJplein.” If you end up at a ferry to “Buiksloterweg,” walk alongside the water to the right (East) — at the other end of the station. The 5-minute ferry ride is free of charge. What do you know about gezellig?